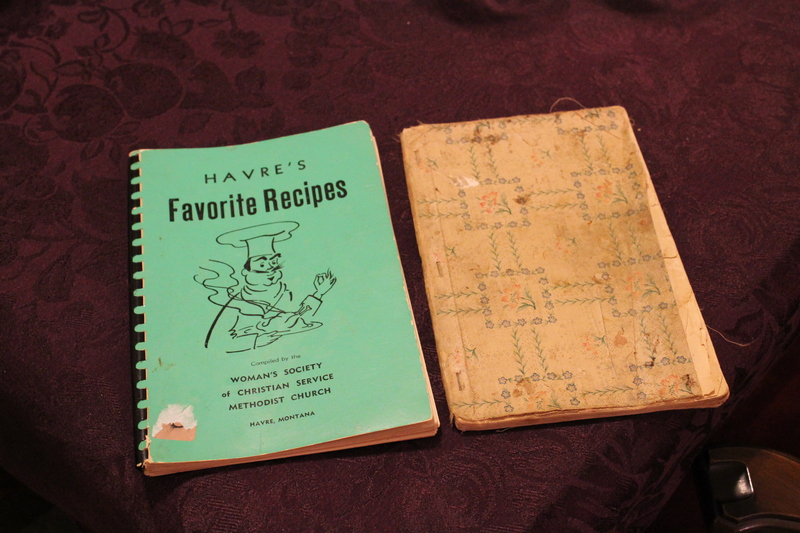 The cookbook collection of the High Line Heritage House Museum is vast and broad. Ethnic cookbooks, holiday cookbooks, cookbooks that highlight one ingredient, decade cookbooks, tea party cookbooks, celebrity cookbooks, Crock-Pot cookbooks, historic cookbooks-they are all in the collection. What I especially love collecting are cookbooks put together by local groups and sold as a fundraiser for whatever cause they are supporting. One published by the Van Orsdel Methodist Church Circle Number Four group in 1932 is believed to be the oldest volume in the Local Cookbook Collection. In 1984, St. Mark’s Episcopal Church released a cookbook and included recipes from its cookbook published in early 1922, but I don’t have an authentic copy-yet! One never knows where one will find volumes! It is my goal to acquire as many of these volumes as possible, as no other museum in Havre is currently doing this. These cookbooks are a treasure trove of information, and it is important to keep a collection local for the community to enjoy. Keeping the collection as safe as possible is paramount-I don’t want volumes “growing feet” (yes, it happens! )-so I’m thinking scanning the volumes and making them available for viewing will be the way to go. I purchase cookbooks where I am able and for a REASONABLE price, and would someday like to sell extra copies as a fundraiser for the High Line Heritage House Museum. They will run the gamut from older, massed produced cookbooks (like Better Homes and Gardens) to a few of the local ones I can acquire. Keep in touch if you are interested! Pictured above is the latest volume added to the Collection. It was published by the Methodist Church ladies in 1950. It is next to the aforementioned oldest-believed volume in the Collection. The cover is old oilcloth, and the book was very well used and loved.